Home » General » How Does(n’t) Your Garden Grow? In my last post I alluded to not being that fantastic of a gardener- remember my example of having five squash plants yet no zucchini? Gardening is hard for me because unlike cooking, baking, and sewing I can’t just turn around and have another go at it like I can after one burnt batch in the kitchen or ill fitting article of clothing, no, I have to wait an entire year to try my hand at it again. This is my third year at attempting to have a vegetable garden, I’ve gotten better each year but not necessarily at the rate I was hoping for. One thing I yearly have going against me is that I spend December-May in Japan, so fresh off the plane we hit the garden at the tail end of planting season. Though our timing kind of stinks I do have lovely local friends (Kelly and Andrea) who share their starts with me which makes a huge difference. This year we’ve been more proactive with our gardening which I think makes the lack-there-of hurt a little more, however from conversations with friends, consulting googling and utilizing my local library we’re slowly building our plans for next year to improve our harvest. Before I go into any and all of that, here’s a very short and sweet garden tour. I relied on the in-ground soaker hose to water the garden too early. Many of my seeds didn’t get the best start because they weren’t getting wet. Just as starts were coming up we got hit with the crazy high 90’s pushing 100 degree weather. I wasn’t as diligent as I should have been in keeping the top of the bed hydrated so the little starter roots died which was detrimental to the overall growth of my crops. 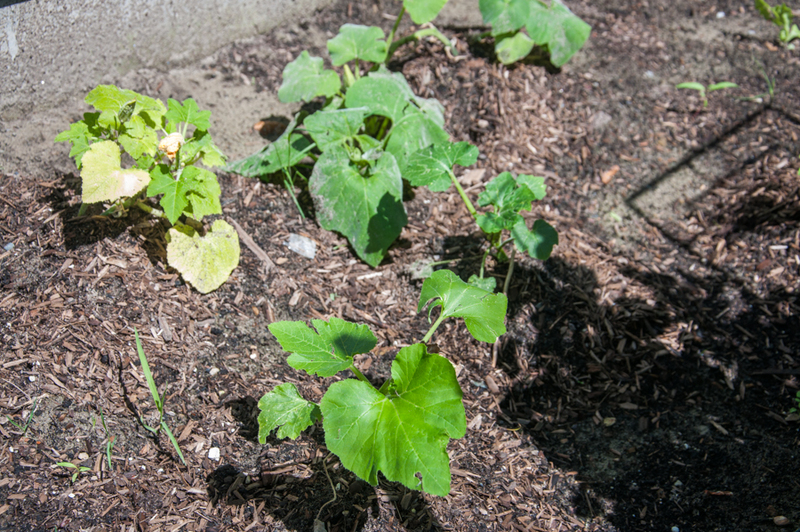 Squash plants (for reason posted directly above) didn’t grow large enough for the plant to allow blossoms to become fruit. Inconsistency with watering as well as moister level (seeing a trend here?). The right side of my garden bed only gets about 4 hours of full sun a day, way less than I assumed it did. I put my onions too deep into the ground. Blossom-End Rot on my Roma tomatoes. This I’m sure is just scratching the surface of our gardening issues but is what we have identified. 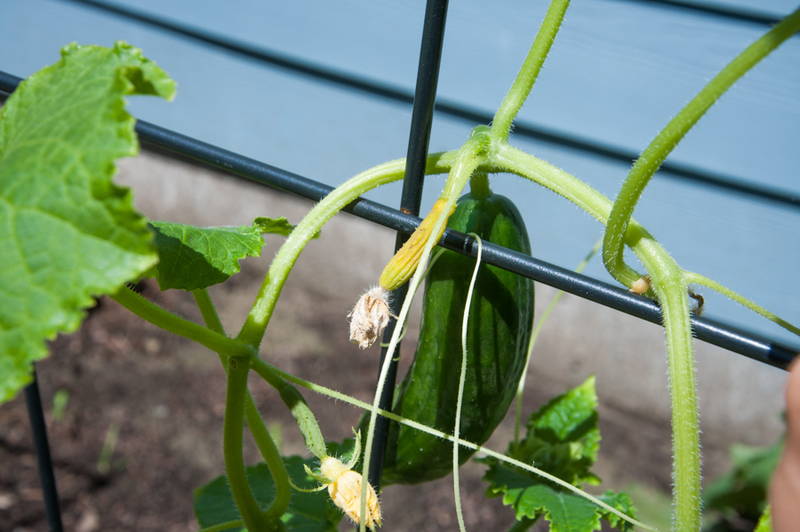 I still don’t know for example why my cucumbers only grow a tiny bit than get yellow and soft and fall off- are the blossoms not getting pollinated, is that what causes this? 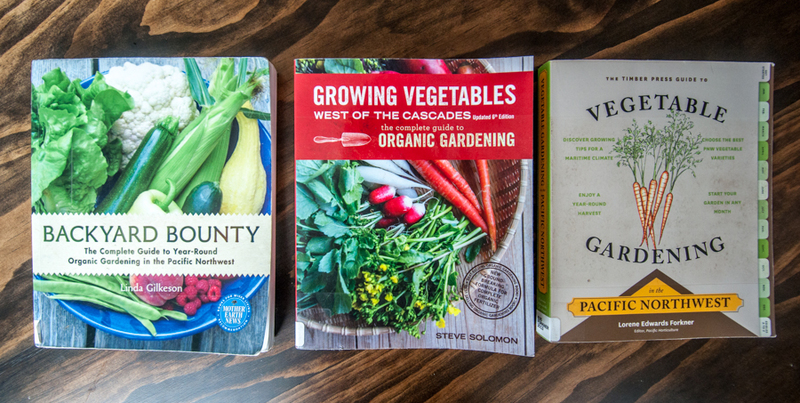 Because we ultimately desire to have a bountiful garden to eat, share, and store I decided to check out these books at the library specific to gardening in the Northwest! Purchase rich nutrient dense soil and place it on top of the bed rather than trying to work stuff in like we did this year. 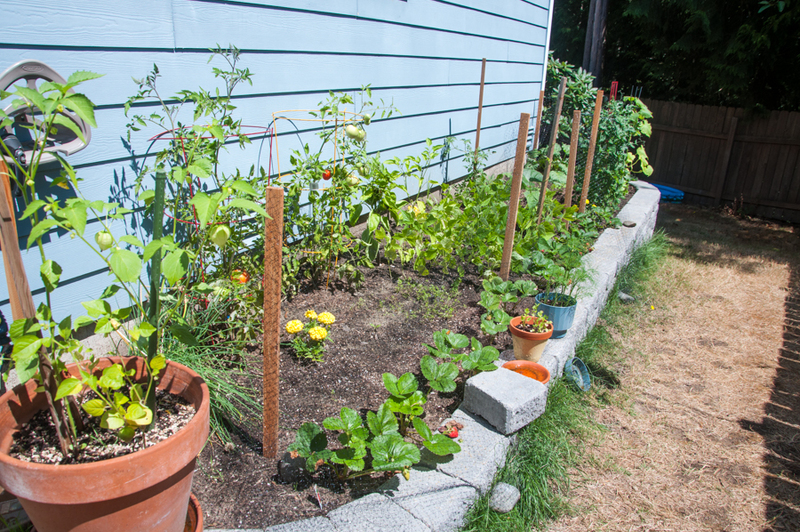 Move the soaker hose to be above ground and plant seeds around it. Be mindful of sun exposure when planting. Build a wood raised bed for the front yard where the sun exposure is exponentially greater (8-10 hours). Build a retaining wall bed in the back corner of the yard where sun exposure is 6-8 hours. Plant seeds closer to the surface. So far these are the improvements that are on the forefront of our minds but I imagine more will come as the growing season continues and I work to educate myself more on gardening. How about you? What are your take aways from this year’s season so far? What are your plans for improvement for next year?